An education technology company that produces a pair of robots for use by kids has just released lessons to help young students learn how to code. The in-house education team of Wonder Workshop, which makes the Dash and Dot robots, created the curriculum. The team also partnered with Kodable to develop a few of the lessons. Lessons introduce students to robotics as well as programming concepts. The coding is done with Blockly, using preset programs. Blockly was created by Google as an open source visual programming language; Wonder Workshop has released app versions of the program that control its robots through mobile devices. The curriculum covers six levels, for grades K through 5. In the level intended for the earliest learners, students get an introduction to robotics and learn about sequences, algorithms, loops and design thinking. By grade 5, they learn about variables. 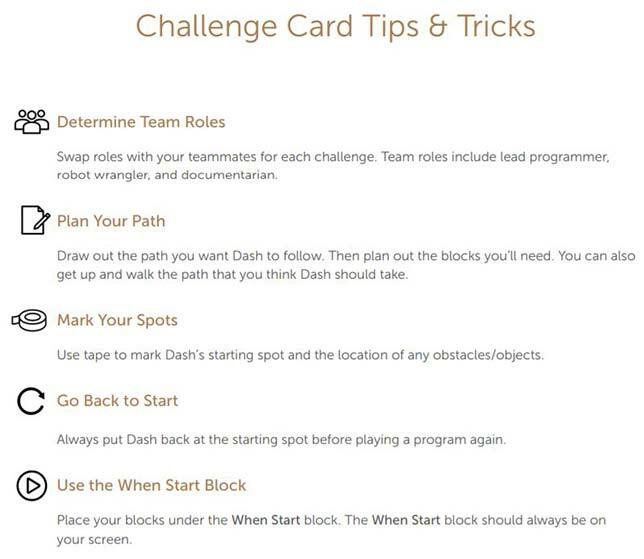 Students work through "challenge cards" that give them tasks to practice. Currently, there are a total of 24 lesson plans and 72 challenges. Many of the materials are available free on the company's website (some with registration), or teachers can purchase a "getting started curriculum pack" for $99. Some educators have found value in the use of Wonder Workshop products for promoting non-technical skills as well. Tiffany Hogg, a first-grade teacher in Fredericksburg, PA, said the use of the robots and coding apps have helped her students "develop the fundamental skills of collaboration, problem solving and persistence through engaging, hands-on activities that enhance lessons in all subjects." According to the company, the curriculum meets Common Core and Computer Science Teachers Association computer science standards and is aligned with ISTE Standards for Students and Code.org's Computer Science Fundamentals series.